Scent Name:Activated Charcoal Dead Sea Salt Scrub Scent Name:Activated Charcoal Dead Sea Salt Scrub Your skin is being attacked by free-radicals and toxins all day. Luckily, O Naturals Charcoal and Dead Sea Salt Scrub is here to save your skin. 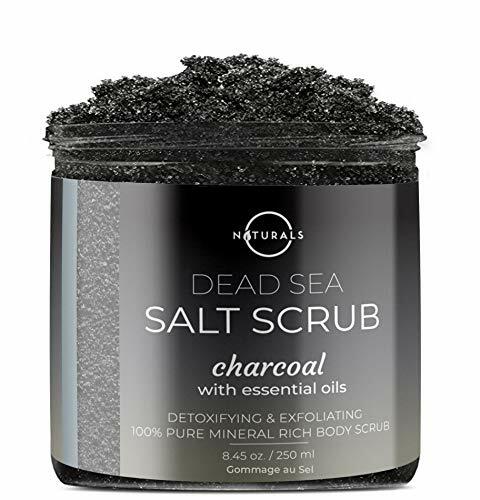 Filled with natural ingredients to protect and detoxify your skin O Naturals Charcoal and Dead Sea Scrub begins the process by removing all the impurities from the skin. The Activated Charcoal digs deep to open up the pores to remove toxins, dirt, and other harmful substances. Then the Dead Sea Salt uses its 21 mineral power to exfoliate away the dead skin. The end result is old skin looking young, rejuvenated, and nourished. No O Naturals recipe is complete without our signature infusions. Sweet Almond Oil, Peppermint Oil, and Jojoba Oil have been strategically added to the already powerful blend. Sweet Almond oil brings two components that make your skin fantastic. It is hypoallergenic and a mild oil that can be used on all skin types. It also contains high doses of Vitamin E and Vitamin A. Both of these will deeply penetrate your skin to really condition and bring out impurities from it. This makes it a perfect compliment to the Activated Charcoal. Peppermint oil has been added to bring a refreshing, clean feel to your skin. It also works away at aches that bother you. Ultimately, it leaves you with brighter skin, a perfect compliment to the Dead Sea Salt. Jojoba oil is a true wonder essential. In this O Naturals blend, Jojoba Oil serves to polish everything off by softening your skin, bringing out its youthful exuberance. As a natural moisturizer, your skin will retain its soft tone all day long. Try O Naturals Charcoal and Dead Sea Salt Scrub for an amazing, at-home spa experience!